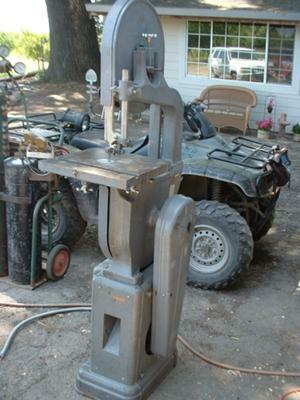 My wife and I were going to Tahoe for the weekend and to Carson City to pick up a Rockwell Jointer. Previous to going away for the weekend, I noticed a Delta 14" Band Saw for sale on Craigslist. Seeing how I just purchased a jointer and many other Craigslist itmes, I didn't think I should push my luck and try to purchase this band saw. On Friday night in Tahoe, I was doing pretty well on a quarter machine. After I hit a fairly good jackpot and started figuring out what I had won, I thought to myself, I'm getting pretty close to having enough money for that band saw so I decided to cash out and proceeded to try to get ahold of the guy without much luck... and he didn't have an answering machine or voice mail to leave a message. We did send an email to him late Friday evening. I was trying to kill time Saturday morning in hopes that the person with the band saw would call or I couild reach him. I must have called 20 times without any luck. After lunch, my wife and I were sitting in our truck deciding which direction to head back home in... do we head home on Hwy 50 and stop at a feed store to purchase supplies for our chickens and new coop I'm building.... or do we head to Reno and keep trying to call the band saw guy. While we were sitting there deciding which way to go, I got the call. He had just opened our email.... and we were on our way to Reno. He was asking for $400. I offered him my winnings of $350 and he accepted it... no problem. He was surprised to have no calls on this band saw so I told him that his answering machine was not working. Things just work out great sometimes don't they? The saw is in excellent original condition, but I do not know the Model No. or year manufactured. The Serial No. is B1 9026. It is for wood only...no gear reduction. Can anybody tell me where to find the year and model?